How many cheeses does the "world's cheesiest pizza" contain? The four-cheese pizza has been coasting on its laurels for far too long, and finally one pie has arrived to show that sucker who's boss. Crafted at Melbourne's 400 Gradi this weekend, the Novantanove Formaggio boasts a staggering 99 cheeses, making it (presumably) the cheesiest pizza in all the land. Resident pie pro Johnny di Francesco, who took the top prize at the Pizza World Championship in Italy this year, is responsible for this modern marvel. To make it, he took 94 of the chosen cheeses and melted them down into a "super cheese" base. 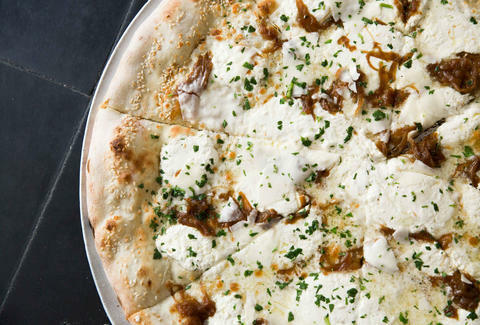 The remaining five picks -- fior di latte, buffalo mozzarella, goat cheese, ricotta, and shaved raspadura -- went on top of that, making for a white pie that merits at least one epic poem. It was all apparently inspired by the latest TMNT, so we guess we can finally forgive Michael Bay for his glaring omission of Vanilla Ice. Kristin Hunt is a Food/Drink staff writer for Thrillist, and probably couldn't name 99 cheeses, but is happy this exists. Follow her at @kristin_hunt.